King vs. Queen: Is the Extra Size Worth It? Home Blog King vs. Queen: Is the Extra Size Worth It? When a twin or full size mattress is no longer adequate, upgrading to either a queen or king size bed is the ticket to a good night’s sleep. It’s often thought that bigger beds are always better, but this isn’t necessarily the case for everyone. There are a number of factors you should consider before investing in your new bed. When you visit a Mattress World Northwest showroom, a knowledgeable Sleep Specialist will equip you with the insider tips that will make your shopping experience worry-free. And be sure to ask about our latest mattress deals! If you’re upgrading from a full to a queen size mattress, you can look forward to five inches of additional space from top to bottom and six inches of extra room from side to side. This might not seem like much, but it can make a big difference for sleepers who are currently feeling a bit cramped. A standard queen mattress is 60 inches wide and 80 inches long. It’s a popular choice for couples, but single sleepers who like to stretch out and extend the limbs sideways will also enjoy the spaciousness of a queen. Queen size mattresses are an excellent choice for guest bedrooms. A queen bed allows you to house your guests in comfort, while not investing in a more expensive bed that won’t see much use. Plus, it makes sense to put a queen mattress in a smallish guest bedroom. Queen size mattresses can also be a good choice for couples who have a small master bedroom. Compared to a king size bed, a queen provides an extra 18 inches of walking space around the bed. Getting a queen instead of a king might mean being able to put in a new nightstand without making the bedroom look too crowded. A standard king size mattress is 76 inches wide by 80 inches long, although slight discrepancies between brands can occur. These spacious beds offer plenty of elbow room for restless sleepers, making it the perfect mattress for couples. King size beds are also a great choice for families with young kids who like to snuggle with mom and dad on weekend mornings. A king mattress can easily accommodate sleepers who extend bed privileges to their large dogs. For many families, the generous proportions of a king size bed are worth the extra investment. 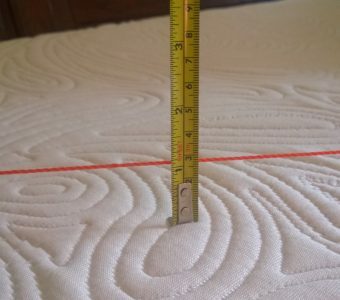 Before purchasing a large bed however, it’s important to break out the tape measurer. Make sure there is plenty of space in the master bedroom for the dimensions of a king, while leaving enough walking space around the bed. Mattress World Northwest invites you to visit one of our mattress showrooms in the Portland area to find your perfect sleep set up. Our friendly staff can guide you in your decision, but will never pressure you into a sale. We carry leading luxury and affordable brands of inner spring, memory foam, latex mattresses, and hybrid beds. Call 503-713-6594 or visit us today!